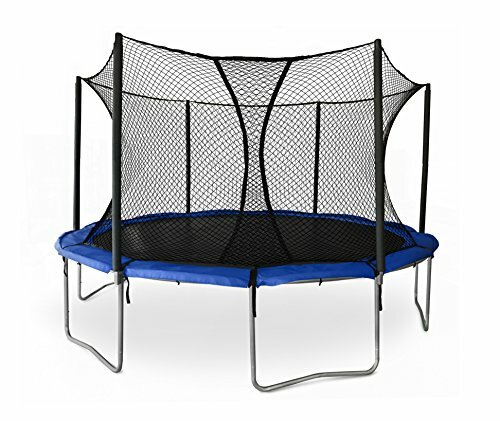 The SkyBounce ES 14’ trampoline is a new addition to our JumpSport line of trampolines. As we are always dedicated to offering the safest, highest quality trampoline at every budget, the SkyBounce ES offers an attractive price point that doesn’t skimp on quality and safety. An upgrade to our entry-level SkyBounce line, it comes with 96 larger 1-inch diameter Extra-Stretch 6.5” springs for smoother bounce, thicker frame padding, and our upgraded safety enclosure system with HALS technology for improved tensile strength. With the enclosure’s patented overlapping entry, durable woven net, and UV protected foam pole coverings, the ES 14’ offers an ideal design to keep jumpers safe. The SkyBounce ES balances affordability with state of the art safety features. Also compatible with our patented games that encourage safer play activities, building athleticism, and improves learning: Game & Party Pak, Big-Top™ Tent and our patent pending Hoppy Balls. Not compatible with the ProFlex basketball set. The SkyBounce ES will help save you money, feel more at peace, lower your environmental footprint, and have more time for your family! JumpSport is a small, USA, family-owned, 20-year-old business. Our founder, Mark Publicover, is the inventor of the trampoline safety enclosure that protects millions of bouncing kids around the world every day. JumpSport is the industry-leading innovator in trampolines. Feel confident with your purchase backed by excellent warranties and customer service. Award-winning woven enclosure net, at an attractive price point, for budget minded families! Patented Overlapping Unforgettable Entry: eliminates unintended fall outs for parents' peace of mind. Meets or Exceeds ASTM Impact Performance Test standards. Easy install, high quality, woven interior mounted net improves responsiveness, durability and longevity on a reactive, yet smooth jumping surface. Larger 1" diameter springs for improved bounce performance. Single-user weight rating of 220 lbs, maximum weight capacity of 520 lbs. Our family-owned company continues to deliver industry leading products are entirely designed & engineered in USA.